With the rapid increase in the “Green” movement and the push for more energy efficient homes, spray polyurethane foam Spray Foam Insulation is growing substantially. As with most new building products, the Spray Foam Insulation industry has had its own set of unique challenges that include the recognized need for training and certification for installers. 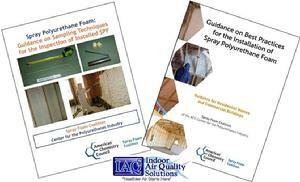 Along with the recognized need for Spray Foam Insulation training are the results of inadequate applicator training, nuisance odors and occupant sensitivity to Spray Foam Insulation. These occupant related complaints have led to a rise in Spray Foam Insulation investigations by many who have little understanding of Spray Foam Insulation and how it can alter the indoor environment even when correctly installed. An IEP (indoor environmental professional) that is attempting to identify how a product may be impacting a home’s indoor air quality and the home’s occupants must begin with the identification and assessment of the product itself. The first step of any product failure investigation would be to identify the product, and then the inspection of the applied product. The actual inspection of the applied product is critical in establishing if the product has been installed in accordance with the manufactures installation specifications and/or industry standards. Only then can there be a determination of correct or incorrect installation and/or product failure. 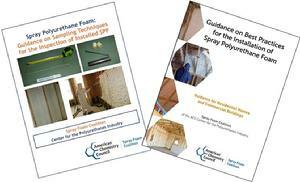 The American Chemistry Council Spray Foam Coalition published the guidance document titled “Spray Polyurethane Foam: Guidance on Sampling Techniques for the Inspection of Installed SPF” which should be used to inspect the current condition of the installed SPF. IAQ Solutions will inspect the installed condition of the Spray Foam Insulation in accordance with the manufacturer’s specifications and the SPFA Inspection Criteria. Is the Spray Foam Insulation, SPF Insulation Installed Correctly? A potential case for product failure or product defect where the product may be negatively impacting the occupants must begin with the establishment of correct product installation and performance. When it comes to the investigation of nuisance odors associated with the application of spray polyurethane foam SPF insulation, I’ve found that most of the investigations typically involve little more than varied attempts at trying to chemically associate the odor with the off-gassing of the Spray Foam Insulation. 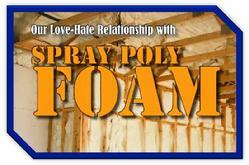 I’ve been assessing spray polyurethane foam insulation SPF for several years on too many properties to list. I’ve assessed a dozen or so product lines both closed and open cell for manufactures, builders, homeowners, and applicators. The properties ranged from universities, community centers, offices, homes, both new construction and retrofit applications. In my experience, Spray Foam Insulation investigations can be categorized in three distinct categories. The first two seem to be the primary areas of Spray Foam Insulation investigations. The first category is simply misapplied Spray Foam Insulation, the second is presence of pre-existing or recently introduced contaminants and the third would be occupant exposure and sensitization during Spray Foam Insulation application. By using these three assessment categories, I have had great luck in identifying the catalyst of the odor and associated complaint. It has also helped raise awareness that it’s not always the SPF Spray Polyurethane Foam Insulation. These nuisance odors are directly associated with incorrectly applied SPFI and can be addressed by either correcting the areas of misapplied foam or by removing and re-insulating the areas. Misapplied includes improper ventilation during the application, incomplete application, off ratio application, and also includes the Spray Foam Insulation in direct contact with recessed can lights in the attic, keyless light fixtures bulbs, dryer vents, and/or chimney flues, all of which can heat the Spray Foam Insulation and cause a tremendous amount of chemical odors. Category 1 is relatively cut and dry and requires the onsite inspection of the Spray Foam Insulation and the collection of no air samples. The inspection of the foam and the determination of correct and complete installation is a critical first step. I‘ve been on SPF insulation investigations where other Indoor Environmental Professionals (IEP’s) who were hired to assess the SPF insulation never looked at the SPF insulation. 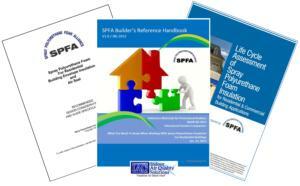 Most have no knowledge of how to assess the correct or complete installation of the SPF insulation. Most IEP’s show up with all manner of air sampling equipment and begin and end their investigation with the collection of air samples intending to identify the chemical signature of misapplied SPF insulation. But that’s just not going to happen. For all who want to conduct SPF insulation inspections, start with understanding what correct and complete installation is according to the manufacturer who produced the foam you are inspecting. 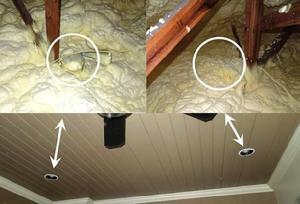 Below, is an example of a home with retro-fit SPF insulation installed in the attic. The homeowners hired an IEP to help establish and/or confirm that the SPF insulation was making them sick. The home was traditionally ventilated with a large rear lanai. As with typical SPF insulation, landscape fabric was used to separate the lanai attic from the sealed SPF insulation attic. However, the large Lanai attic space was not properly ventilated as shown in Diagram 1. The lanai had soffit vents and no off ridge vents hence the incomplete attic ventilation. 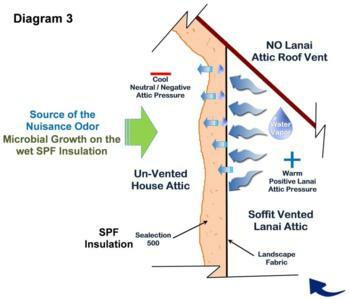 The outdoor air pressure (wind) was moving the hot humid Florida air into the attic and into the sealed Spray Foam Insulation attic through the landscape fabric and Spray Foam Insulation as shown in Diagram 3. The moisture was supporting microbial growth that was the actual odor identified within the home. 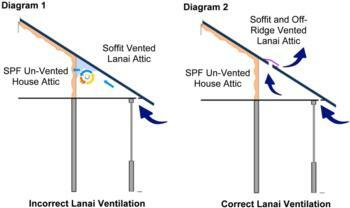 The correction was to first relieve the lanai attic pressure by installing an off ridge vent as shown in Diagram 2 and then by removing and replacing the mold damaged Spray Foam Insulation. Unfortunately, thousands of dollars were spent on the hunt for the infamous misapplied chemical signature of the off-gassing Spray Foam Insulation; of course, to no avail. This is just one example of the easily overlooked yet painfully obvious issues with incomplete or incorrect Spray Foam Insulation. This category cannot be stress enough to the professionals that are investigating SPFI. This category runs the gamut and can include some rather odd contributors to occupant discomfort and nuisance odors that become much more concentrated when the SPFI is installed. These include the HVAC system, air exchange rate, storage of materials in the now sealed space, insect and or rodent activity, routine pest control applications, the previous insulation condition and material, proper ducting of kitchen and bath fans. The possibilities are endless and all must be considered. Remember, what has accumulated in the attic is now semi-conditioned air that is shared with the attic and living space of the home. For example, if the home is a 60 year old ranch that had open cell SPFI installed at the roof sheathing and the attic was not cleaned to help save a few bucks, the bath fans are ducted to the attic space, and the home once had a rodent issue that was treated with poisons. Well, to say the least you have a huge list of contributors to occupant discomfort and nuisance odors. Most of the SPF insulation investigations I am called in to review all of these issues were overlooked simply because of the recent application of SPFI. It’s not necessarily the SPF insulation that is producing the odor or contaminate that is causing occupant discomfort, but the SPF insulation eliminating the natural ventilation of the attic which prevented the odors and contaminants from entering the home. 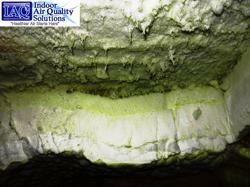 The SPF insulation has now trapped the odors and contaminants within the semi-conditioned space. In this case, the home also had no outdoor air and the home was accumulating VOC’s from daily use products. The same home was blower-door tested and didn’t even come close to the minimum ASHRAE air exchange rate. That attic air is now a part of the occupied space as semi-conditioned space and has 60 years of accumulation of who knows what. Easily, it could include the accumulation of dust, debris, fiberglass, rodent and insect activity, prior application of pesticides, or maybe even vermiculite. This is a huge aspect of an SPF insulation investigation that I find all too often overlooked. As a professional investigating SPF insulation, you have to ask questions beyond the obvious, who was the demon SPF insulation manufacturer. Sometimes it’s best to keep it simple, particles, pathway, and pressure. Remember to keep an opened mind; it’s not always the SPF insulation. On a retrofit SPF insulation investigation where there was an odor described as rotten eggs or sulfur, the home owner hired an IEP to help establish that the SPF insulation was making them sick. The IEP’s hired to find the odor focused on TO-15 sample collection throughout the home. They were confident they identified the misapplied SPF insulation chemical signature. Not quite. Just under $5,000 later, it was determined that the samples identified a chemical cocktail that could have been the result of just about everything used within the home over the last year since the SPF insulation was applied. 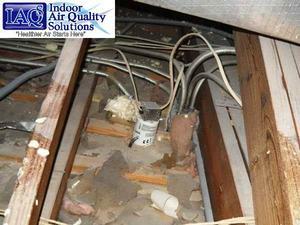 With no outdoor air supply and poor ventilation, the VOC’s created within the home stayed in the home. What the IEP’s didn’t notice was a failed air admittance valve in the attic over the area where the odor was the strongest. 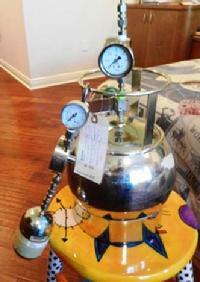 At a cost of twenty bucks for a new air admittance valve, the odor was eliminated. On a new construction SPF insulation investigation, the IEP’s hired to establish that the SPF insulation was making the homeowners sick once again set up the VOC sample collection center and collected four TO-15 / 8 hour summa canisters and 8 sorbent tubes from a single story 2,200 square foot home. The homeowners reported that after about a year, the home began to make them feel worse when home than when away. The culprit in their mind was the SPF insulation. When I asked them how they came to that conclusion, they said Google. They then hire an IEP to help them prove to the builder that the SPF insulation was making them sick. As the IEP was setting up their summa canisters, I began my investigation that started with the condition and settings of the homes ventilation system. I knew the home had outdoor air supply. I simply wanted to determine the thermostat and Aprilaire settings and establish the amount of outdoor air being supplied to the home. As shown in the photo, the Aprilaire ventilation controller was set to “Off” and the outdoor air supply closed. When the 8 hour sampling period was over and the IEP was collecting their equipment, I cranked up the AC and opened the Aprilaire ventilator to 30 minutes per cycle. During the sampling period of 8 hours, the carbon dioxide levels were measured above 2000 ppm and the tVOC’s were measured at a mere 700 to 800 ppb. After 1 hour of proper ventilation, the carbon dioxide and tVOC levels were reduced by more than 50%. Amazingly the issue proved to be accumulation and not production of VOC’s. 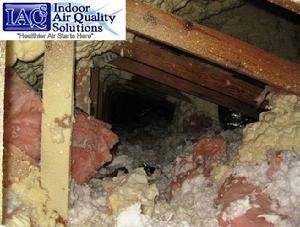 Once again, a complete investigation identified an issue with the ventilation that was misdiagnosed as SPF insulation. On another SPF insulation investigation, the homeowner had spent thousands on sampling with an IEP who felt he had established the connection between the SPF and the occupant symptoms. Again, reviewed by the PhD’s and chemist found no such connection that could be corroborated. However, the interview found that the homeowner was in the second floor master bedroom during the application of the SPF insulation. The access to the attic was in the master closet, nice. The applicator didn’t want to use landscape fabric to separate the large covered second story balcony just outside of the master bedroom so the applicator just applied the SPF insulation to the ceiling of the balcony. The photos show two of the nine recessed can light fixtures that were covered in the foam from completely covered to just shy of completely covered. The homeowner liked to sit outside in the evening and look out over the lake. However, he reported that he could no longer spend the evenings on his beloved balcony because he was so sensitive to the SPF insulation. Yes, he had become sensitized to the SPF insulation because he was in the home during the application but the trigger or catalyst to the odor was the heating of the SPF insulation just outside his master bedroom and just above his beloved balcony each time he turned on the balcony lights. Sometimes as IEP’s, we are hired to provide a very specific service. I’ll use mold as an example. When some IEP’s are hired to provide a mold inspection, they often become far too focused on looking for one potential contributor and often overlook the many other and often obvious contributors. Samples for mold spores are collected and moisture is hunted with a vengeance but not much else is looked at or investigated. SPF insulation investigations are the same. Are we hired to help the homeowner identify what in their home may be contributing to their symptoms or are we there to prove their hypothesis that it is or isn’t mold or SPF insulation. IEP’s often go in with blinders on and lose focus on the true intent of the investigation which in my opinion, should be “What is contributing to occupant discomfort and complaint?” The IEP should approach the home as a system and be open to all potential contributors to occupant complaint. The chief characteristic that distinguishes the scientific method of investigation from other methods of investigation is that scientists seek to let reality speak for itself, supporting a theory when a theory's predictions are confirmed and challenging a theory when its predictions prove false. Scientific investigation is generally intended to be as objective as possible in order to reduce biased interpretations of results. This is often overlooked when the IEP conducts an investigation focused on making the evidence support their hypothesis without an objective challenge. IEP’s must remember, that while the SPF insulation may be the issue, unless you can say there are no other issues within the home, you have not completed your investigation you have just begun. This category includes all occupants who have become sensitized or allergic to the odors given off from Spray Foam Insulation. With sensitization, occupants have either re-entered the property shortly after the Spray Foam Insulation is applied, well before the manufacturer recommended re-occupancy time of 24 to 48 hours while the Spray Foam Insulation is still curing and off-gassing, or in the most severe cases of occupant sensitivity the exposure was actually took place during the application of the Spray Foam Insulation. I then asked him if he was curious as to how the Spray Foam Insulation was applied and he of course told me that he was very curious. He told me that he was in the attic while it was being applied. Incredible right, you can’t make this up. I asked if he thought it was odd that the applicator was in full protective equipment with supplied air and he was just watching in street clothes. I also asked if the contractor told him that he shouldn’t be watching without personal protective equipment. He told me that the contractor told him that he shouldn’t be up there when it was being applied but it was his house and he was the builder so he was going to do what he wanted. I asked how long he was up there and he said about 30 minutes and then he began to get a huge headache. Unbelievable, he was incredibly sensitized to the foam and no amount of misapplied Spray Foam Insulation removal was going to provide him any relief. Sensitization of the occupants can be a result of many issues such as occupants that don’t want to spend the money for a hotel stay, early re-entry or occupancy, the curious application observer like the builder above. However, occupant sensitization can also be the result of the lack of proper ventilation during the application. Venting the off-gassing of the SPF insulation during application is critical and often not conducted at all. In all cases of occupant sensitization that I have been involved with, the SPF insulation application was not properly vented to the exterior which created a substantial accumulation of the off-gassing chemicals within the property. These trapped volatile organic chemicals VOC’s are what sensitizes the occupants who have either re-occupied too early or were present during the SPFI application. Sensitization occurs when the occupants are overexposed to the trapped volatile organic chemicals VOC’s and become sensitized. From that point on, any exposure to even a minute amount of the chemical causes a reaction. The process of sensitization can make a home unlivable for people who become sensitized. Homes that have improper ventilation during the application process of the SPF insulation are also included in the misapplied category and almost always have identified areas of misapplied SPF insulation (SPFI). This category is unique in that any attempt at reducing the occupant’s exposure to the SPF insulation that they are now sensitized to may not be of any relief. I have had no luck in providing sensitized occupants relief from the home they are now sensitive to. I have been involved in everything from the introduction of outdoor air through a pre-filter and dehumidifier to control the temperature, humidity, particles, path, and pressure to full removal of the SPF insulation. Unfortunately that bell can’t be un-rung. By expanding my approach to SPF investigations, I have found that not all SPF insulation complaints are a result of misapplied SPF. This has led to my believing that I’m simply ignoring the issue of misapplied SPF or the concerns with occupant exposure to the application of SPF insulation. That could not be further from the truth. Of the three categories discussed in this presentation, two directly address the areas I’m often accused of either avoiding or ignoring. It’s the second category that seems to raise concern with other IEP’s investigating SPF Insulation nuisance odors and complaints. However, I stand behind this category and strongly believe that many homes have a presence of pre-existing or recently introduced contaminants. I also believe that as a responsible IEP, I owe it to the occupants to look at all areas of the home to ensure the occupant’s health and safety. The SPF Insulation industry has a tough road ahead of them in setting attainable goals and standards that can be enforced to help prevent categories one and three. Of the three categories, the easiest to prevent and avoid is also the category with the greatest impact on the occupants, category three. By inspecting homes and directly addressing each of these three assessment categories, I have had great luck in identifying the catalyst of odors and associated complaints when SPF insulation is added to a home. The use of these three categories has also helped raise awareness that it’s not always the SPF. National Standard requires that the spray polyurethane foam material be installed in accordance with the CAN/ULC S705.2 standard for Thermal insulation – Spray applied rigid polyurethane foam, medium density – Application. Application Standard lists a number of requirements for the manufacturer (seller of the two liquid components), the contractor (the corporation who has the contract to perform the installation) and the installer (the worker who actually sprays the components to form spray polyurethane foam on the job site). Application Standard sets forth requirements for environmental conditions suitable for spraying, substrate requirements, installation requirements, daily testing of the installed products and documentation requirements. The Licensed Contractor is required to use applicators that are trained and certified under the SPF Quality Assurance Program used by CUFCA. Each installer is issued a plastic photo-identification card every July 1. The installer is required to carry this card with him during the complete installation period. Is Spray Foam Insulation Right for You? "Build It Tight and Ventilate It Right"